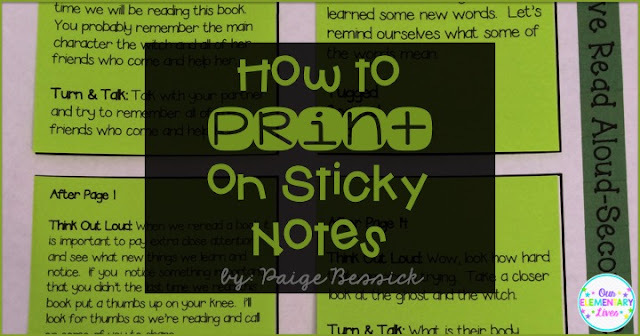 Have you ever wondered how people print on sticky notes? Well, it is one of my favorite things and I'm going to give you step-by-step directions. Ready for your life to be changed forever? Then keep reading, it's really very simple. 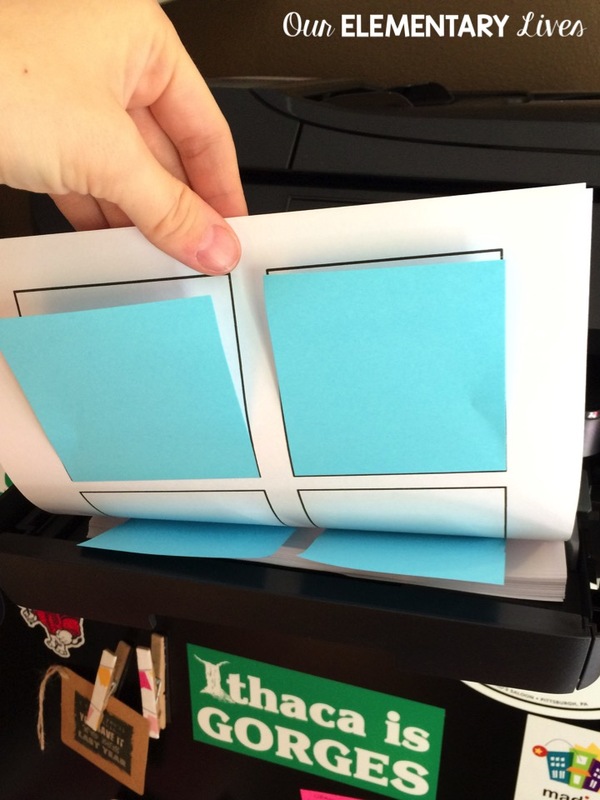 Printing on sticky notes really will change your life forever. 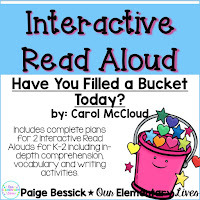 They make interactive read alouds (one of my favorite things), notes home, data collection or writing rubrics so easy. The first thing you need to do is to get all of your materials ready. Now let's talk about all of these things. When I say good sticky notes, I mean GOOD sticky notes. 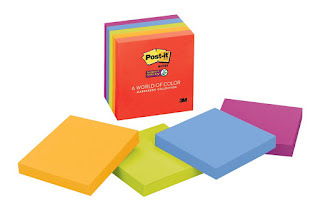 I like Post-It brand and will even splurge for the super sticky ones because they are the stickiest. You don't want to go through the trouble of printing them and then they don't stick. Click the picture to be taken to Amazon to see this product. Then you need a sticky note template. Click HERE or on the image below. It will take you to this template for FREE! 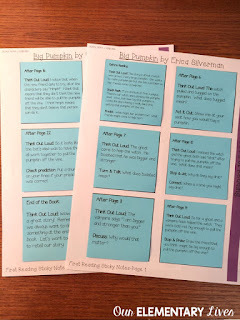 You will want to print out several of these templates for however many pages you want to print. 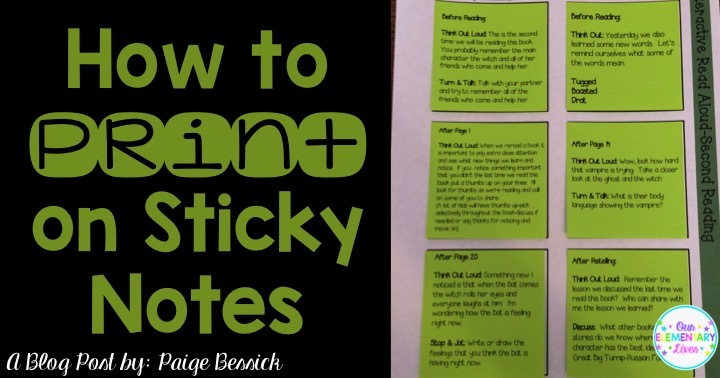 If you need 6 sticky notes, print out one page. If you need 12 stickies, print out 2, etc. Choose from black or gray outlined boxes. The template here is for 3-inch by 3-inch sticky notes. That is the size I primarily print on. 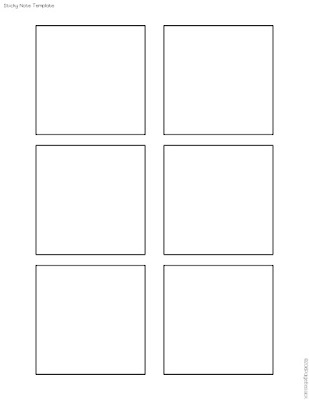 I'm also going to give you an editable powerpoint version of the templates so you can type what you want into them. Click HERE or on the picture below. 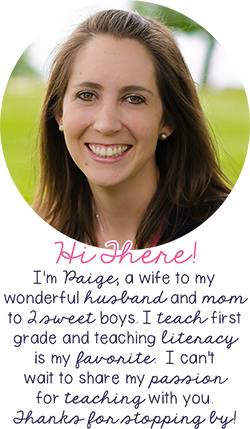 You will want to make a copy then download or open in google slides to edit. Please email me at ourelementarylives@gmail.com or comment below if you are having a hard time with this. The last thing you need is a printer. I have done these on copiers at school, but it gets kind of messy. It is much easier to do on a printer. 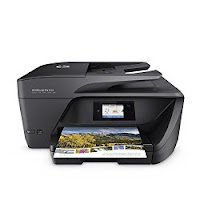 I just got the HP Officejet 5741 with INSTANT INK!!! This one is similar for only $90. It is a life saver! You may have seen my Instagram. If you don't know about HP Instant Ink, you probably need to. You can find out about it HERE! Essentially you pay a reasonable monthly fee and get ink cartridges sent to your door. It's so awesome! If you're looking into it and want a free month, you can use my referral link HERE. It's pretty much the greatest thing ever for a teacher after Astro Bright cardstock and flair pens, of course. It was a very happy day when my printer came in the mail and I set it up and actually had a printer that printed beautiful color pages. OK, so now you're set. 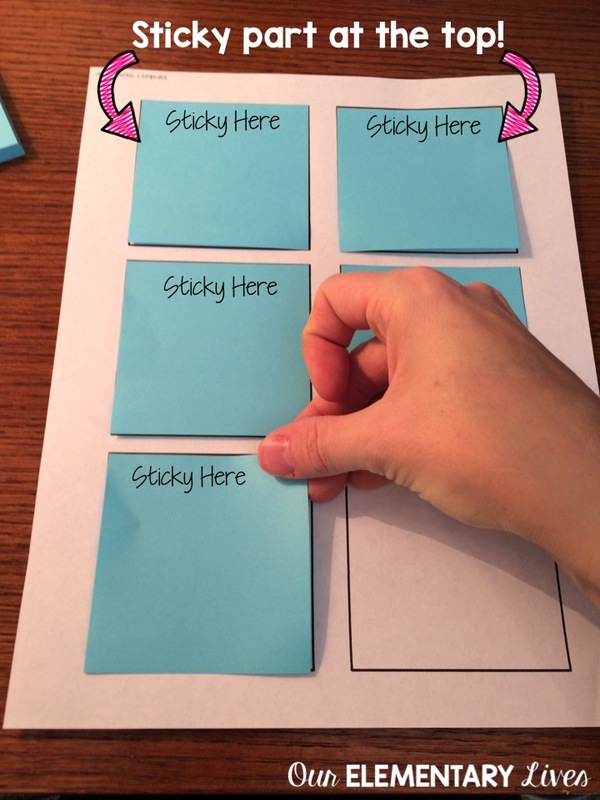 You have everything you need: sticky notes, templates, and a printer. Now you need to prep the template. Type whatever you want into them. 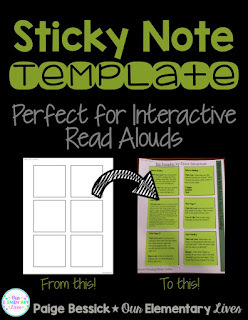 Then put your sticky notes on one of the blank templates. MAKE SURE YOU PUT THE STICKY PART ON TOP! You also need to know where the ink goes when you put a piece of paper in the paper tray. Does it go on the top or bottom? On my printer, I know that when I put a piece of paper into the tray, the ink will go on the under side of the paper. So when I put the template with the sticky notes into the paper tray, my sticky notes are facing down with the sticky part going in first. See the picture below. Now on your computer, press print! It's a little nerve-wracking at first and you may not get it the first time, but don't give up! 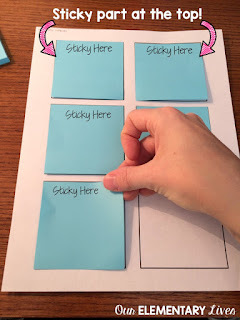 Once you have figured it out, take pictures, make a mental note or just remember how you put the template with the sticky notes into the printer and you are in for an endless amount of easy sticky note printables! Pin this now for easy to remember directions just in case you forget how to do it. 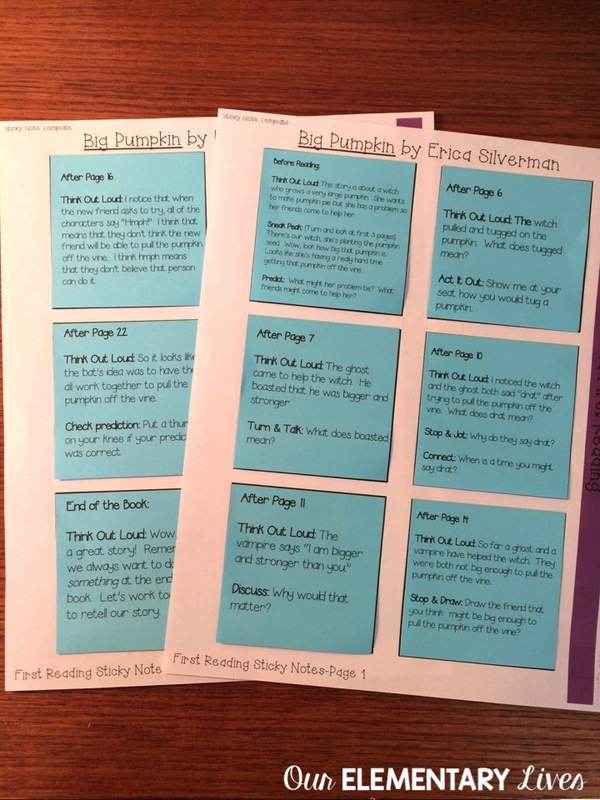 Like I said, I print on sticky notes the most for Interactive Read Alouds. I prep and plan for what I'm going to say then put it on a sticky note in the book so I'm ready to go. Easy peasy lemon squeezy. Do I sound like one of your students? Can you tell how much I love printing on sticky notes? 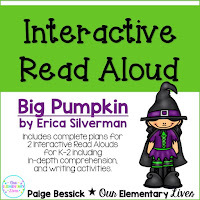 If you're interested in finding out more about my Interactive Read Alouds, click on the products below or click HERE to be taken to the custom category to see them all. I have several and am working on more. So I hope this helped you and was easy as pie. 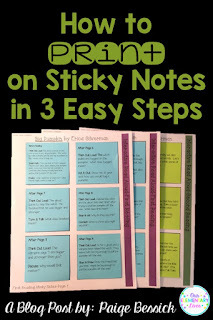 Let me know if you have ever printed on sticky notes in the comments and what you like to print on them. I'm aways looking for more ways to use them. Thank you so much! I have a lot of problems writing and this was so perfect when I need just a sticky note to be used. This was sooo very helpful!!! 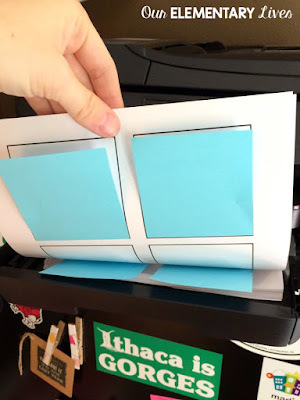 I have the same printer and I thought I was doing something very wrong because my stickies were always getting hung up and eaten. I am doing exactly as you are so I. don't. know. why the printer has decided to eat the stickies. Half way down the sticky note they are curling up, that could be the reason. They are not laying flat. I will try with some flat ones. I hope I don't have to stop... Thanks for your post. I was wonderful! !